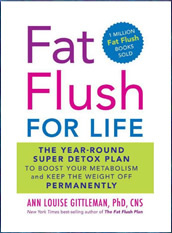 The Fat Flush Plan can be found in a book by Ann Louise Gittleman. Ann has previously written a number of books and articles about nutrition and detox diets. The Fat Flush Plan is both a detox diet and a weight loss diet. The idea is to provide all the necessary ingredients to boost metabolism, reduce water retention, and promote fat loss. This is a restrictive phase of between 1100-1200 calories per day. The intention here is to “lose bloat” – which refers to reducing water retention as well as some fat loss. In this phase you are not allowed to eat; margarine, alcohol, sugar, oils or fats (except flaxseed oil), grains, bread, cereal, starchy vegetables, dairy products. Even the herbs and spices are restricted to a small list. Here the calorie allowance is lifted – to 1200-1500 calories. The idea is to continue on with the program until the desired weight loss is achieved. Essentially a weight maintenance phase, with a caloric intake of 1500 calories or over. Some starchy carbs are gradually re-introduced, along with gluten-free grains, and some dairy. The program contains a significant exercise component. This can be anything from 20 to 40 minutes of exercise per day, depending on the phase. This is typically low-impact (walking). Strength training (lifting weights) is also on the list (twice a week). A sleep prescription of exactly 8 hours per night is also required. Vegetable scramble – 2 scrambled eggs, with spinach, green peppers, scallions, and parsley. Look for other recipes that could be used with the Fat Flush Diet here. The Fat Flush Plan retails for $24.95. Your grocery bill may also raise due to special foods needed such as gluten-free items. The Up side The Fat Flush program has all the elements of a good and healthy weight loss program. It isn’t hard to find success stories regarding this program (however the true test is always the test of time – is the fat loss sustained or temporary?). Remember this diet is a detox or cleansing diet, thus the very restrictive phase one. Unless healthy eating patterns are applied to your lifestyle, any benefits gained will soon be lost. The Downside One criticism is that the calorie level in Phase 1 may be too low for some people (particularly men), and the lower calorie levels could have the affect of slowing down metabolism rather than speeding it up. There is a significant exercise portion (which is a good thing) and fortunately the longer exercise is added during phase 3. However there is little chance the calorie levels of phase 1 (or 2) will support a strong exercise regimen. This diet is like many other diet books – the one size fits all approach will never suit everyone. Eight hours a sleep a night may be excellent for some, but with 40 minutes brisk walking a day, plus 2 weights sessions per week, this sleep is simply not enough for some people. This diet is a book and like all those hundreds of diet books sitting on the shelves, you need to be a fairly motivated and focused person. This is why many of the on-line diet programs have been successful – they offer community, personalized support, lots of on-line tools and menu generators etc, AND can personalize your diet for YOU. How many times have you tried the “latest new diet”? Only to find yourself back where you started 6 months later. It’s good to have a buddy system. NOTE: Many medical professionals question the validity of most detox diets as there is little empirical evidence to suggest that any detoxification occurs. The book describes general recommendations on how to structure your diet with lean proteins, healthy fats and low-glycemic index carbohydrates. However the foundation of the Fat Flush for Life program are the seasonal detox plans that help your body to cleanse and eliminate excess fat by taking advantage of your way your body naturally responds to the seasons. This program helps to jump-start your metabolism and protect your immunity while keeping you feeling warm and satisfied in cold weather. Release liver toxins while nourishing the body with a lighter way of eating that is cleansing to the body. The detox process is accelerated to help you burn fat faster during the warmer time of the year while still focusing on releasing accumulated toxins. A vegetarian plan that enhances body cleansing and resets metabolism. A plateau-buster that is guaranteed to help you take your weight loss to the next level. This plan helps to shift stubborn weight gain and incorporates the use of thermogenic herbs and spices. i lost 10 lbs for first hour when i use this diet. Did the flash flush diet several years ago. Lost 8 lbs the first week. Overal ended up losing 14 lbs. and two dress sizes. Whenever I am looking to jump start a weight loss habit I start with this program for the detoxing effects. On the downside I have never completed all three phazes or did this for an extended period of time. If you are ready to diet and want some quick weight loss to get you excited than this one is for you. You will feel awsome a few days into the program ! Only the strong will survive, especially if you have partner that eats whatever they want and not gain a pound. I started this diet a week ago and I’ve lost 7 pounds. Phase 1 is kind of boring, will be moving to phase 20 real soon. i just have those last 10 lbs. to lose. will i see the same results?? i like what i’ve read so far. thanks! I started a week ago and am down about 10 lbs. Feeling much more energetic and not totally sick of the bland choices yet. I am going to continue on phase one for as long as I can because the weight is literally melting off! I did this diet (not 100%) and lost 20 lbs the first 2 weeks. It has been two years and the weight is still off even though I’m not on it at the moment. I felt wonderful. I would not recommend the cold turkey no caffeine as the headaches are not worth it!! I drink 1 cup of regular coffee a day. It does work (even if you don’t do it exactly) and you will be amazed at how loose your clothes will get so quickly!! this is the ONLY diet that has ever worked for me!!! I have tried this diet a few time and can’t get back the 1st week. Even though I had lost 5 pounds I got very bored. I feel like because the spices even are so limited I was always struggling to find food that was quick, good and tasted decent. I find that grilling meats just naturally gives it more taste but I can’t always do that because of weather. Any recipe ideas people can share would be greatly appreciated. IAM NOW ON THE FLAT FLUSH FOR LIFE AND I REALY LOVE IT. I WASE SIZE 20-22’S NOW IAM 17 TO 18 SIZE I REALY LOVE THE DIET. I did this cleanse/diet back in 2005 with great success. The reason I started it was because I had an itchy body and the doctor couldn’t figure out what was wrong (I used to scratch my legs until they bled and it was spreading). I went to specialists and everything was normal, tried every kind of cream under the sun, nothing worked. I was desperate for a solution and figured I might need a good cleanse. I read up on cleansing products and they just scared me. However this body cleanse sounded healthy (all natural products), and I liked the way Louise wrote the book. This diet flushed out whatever was going on, yippee!!! The upside was that I also lost weight with great success (7 pounds the first week), but I followed it to a T. I did everything that was required. Unfortunately I couldn’t stick to it and slowly gained the weight back – I like my wine, and this diet is basically alcohol free; I like certain grains that are no allowed. Because of it’s restrictive nature, it’s hard to live by forever, and so I ended up completely falling off the program. That being said, I always go back to the basics of this when I need to lose some weight – I think her concept is solid. This time though I decided to do a combo. I found a website called http://www.sparkpeople.com (it’s free and amazing) for helping me with my weight loss. I’m following the Fat Flush program Phase I and II while doing sparkpeople. I will eventually figure out the foods/diet plan that works for me and will hopefully be able to maintain my weight loss this time. I am very hopeful. But I definitely believe in the Fat Flush Concept for kicking off any weight loss program, we all need a good cleanse every now and then! In response to Deb’s cranberry juice recipe, dated 01/09/10…..you’ve got the recipe right with one exception…NO SUGAR, absolutely no sugar is allowed on this diet. The only really accepted sweetener is Stevia. Go back and re-read the book to be sure of your facts before misinforming people. This diet seems to be working. My wife and I started it Monday March 8, 2009. I so far have lost 7lbs and my wife has lost 5lbs. The biggest problem we have run into is that we drank way to much caffine. We would dring at least 60 cans a week betweens us. This diet has caused us to have major headaches. Although a week later they are not hurting nearly as bad as they had been. I can manage without drinking a can a day. My wife is still strugling a little but wow we still have a twelve pack that we bought before we started. I am really looking to see how the results are by the end of this week. To all who try this keep it up I’m sure you will do great. To everyone that thinks this is just another fad diet that will not work in the future, you’re all wrong. This is basically teaching the skills how to eat healthy again. I think that a lot of people lose weight and then stop eating healthy, that’s why people gain the weight back; not because this is a fad that doesn’t work. If a person sticks to it, and continues to eat healthy and exercise, they will keep the weight off. I will recommend this to anyone who asks. I am a 41 year old male, 6’2″ and I weighed 260 lbs. I just completed phase 1 and lost 21 lbs. I intend to continue on to my target weight of 210. This diet works! I feel great and do not have cravings. I stopped Caffeine, Alcohol, sugars and don’t miss them so far. Please tell me you aren’t trying to lose weight. It’s awesome you are thinking about your health and for good reason. Today more than ever, kids are tempted with insane amounts of sugar and snack foods marketed directly to you! But let me remind you that your body is trying to grow and needs certain vitamins and minerals in order to do so. Make sure you are taking a good multi-vitamin daily and getting your grains! Phase 3 of this plan may be suitable for you but you’ll need to adjust slightly and be sure you increase intake according to your activity level. Just try laying off any convenient foods and soda and eating your veggies! Also keep in mind you may be forgetting to get enough water. You are at a healthy weight and I wouldn’t recommend being on any diet. You are in school and it would be very difficult to prepare all your snacks and meals each day. Don’t waste your youth trying to lose weight. Instead, remember you are beautiful and the best thing you can do for yourself to believe that is to feed yourself healthy foods, not diet. I want to share that I’ve been living the fat flush diet lifestyle for years and I couldn’t be happier to continue to spread positive word on the benefits of this diet. It gets right down to the truth. There are no short cuts or easy packaged snack foods filled with preservatives and empty calories. I love this diet because from day one you are addressing the real issue which is carving everything out of your diet and slowly re-introducing only the foods you find you do not react negatively to. We sometimes don’t think twice about being a little puffy, bloated, gassy or tired throughout the day or after meals. With the fat flush- you will never have those symptoms again. It really truly nourishes you for the optimum liver health. I encourage anyone to try it for three weeks. And ladies, note your PMS symptoms before and after going on the flush. You will be pleasantly surprised at the benefits this plan has beyond weight loss. I always tell friends to start with phase 2 and then work back to phase one. This really helps with adjustment. Also, if you don’t want to try the diet simply because you can’t give up caffeine- then just have a cup of black coffee in the morning and stick to the diet everywhere else. Simply giving your best effort in the beginning will motivate you as the week(s) progress. Soon you’ll be in week 3 and maybe you’ve cheated a little but you will have seen enough of a change to really push yourself to go 100% and into Phase 1. Good luck! my friend just recommended this diet and I plan to start it soon. I hope that all will go well. DAY 1! I am starting this diet today! I plan to follow it exactly & I am hoping to loose a pound a day. I am looking to loose 11 lbs in 11 days. Some people are posting losses of more than a pound a day, so I figure this is a reasonable goal. Wish me luck. Will keep you posted on my success. sweetening it with a fruit sweetener or you can drink it unsweetened. Wash and drain fresh or frozen red-ripe cranberries. Combine cranberries and water in a large pan. Bring to a boil. Reduce heat and cook until berries burst. Strain juice through a fine strainer lined with cheese cloth. Sugar can be added to juice to your taste. Reheat juice until it is almost, but not boiling. Pour into jars. Allow to cool before refrigerating. I have Celiac Disease and require a Gluten free diet. I gained a LOT of weight going Gluten free because many GF Foods are made with a lot of starches rather than healthy whole graine. I have never tried this diet because I thought there was a sprouted wheat bread required. I cannot eat wheat on a GF Diet. Can anyone expand on this, Is this diet reall THAT Gluten Free friendly that foods needed would be those that are Gluten Free? Thank you. I weighted 197 pounds when I started the diet and 5 months later I weigh 163 pounds. The single biggest thing this diet did for me was give me more energy. I think it forced me to stop eating all the carbs. I did lose about 10 pounds in the first 2 weeks. When I went to phase 2, I started a cardio routine and have not stopped running. I run 5-6 times a week for at least 30 minutes. I have learned to maintain my habits. So when I have a drink now, I make sure to burn it off by exercising. Calories in, calories out. No secret here.. the diet will get you started in the right path, but you have to maintain it. the sample plan given here, is this a proper plan? iv read that primrose oil and some supplements should be taken as well? if someone could please tell me a list of foods allowed n what supplements etc have to be taken. and is the cranwater 1 part cran to 4 part water or 7 part water? 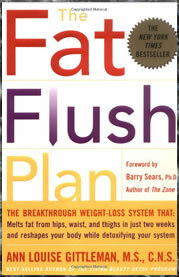 I love the science and health behind the fat flush plan. I had mid section weight, not much, but enough to limit me. I did not lose weight for over 2 weeks, but then it started falling away and especially around the midsection. It was those stubborn 7 or 8 pounds that I did everything to get rid of in the past. By the time I got to phase III, I felt I could stay on this forever. I do the phase I & II 4 times a year and phase III the best I can the rest of the time. I feel and look better than I did in my 20’s!!!! When i was 14, i was 166 pounds, and a size 14/16. I was a fat girl. Everybody told me i wasn’t, but i knew i was just when i looked in the mirror. It didnt help when all these girls in my grade were size 0’s. When i graduated my 8th grade year I decided i was DONE being the FAT girl. My mom helped me with this too, she did the Fat Flush Diet with me. By the end of the summer I had lost about 26 pounds, and weighing about 140 pounds. Im 17 now, still about 140 pounds, but i’ve decided id like to lose some more weight…so i started back on the diet last Sunday. Me and my mother took our “fat pictures” and we are going to picture ourselves every two weeks to calendar our losses. I weighed in at 141.5 on Sunday, it’s Thursday now and im weighing in at 138.5. Im very pleased so far…not just with the loss…but i feel so much less bloated and so much more energized! My husband and I have been on this fat flush cleansing diet for 3 weeks and have not lost any size in the mid section. We both lost 10 lbs everywhere else but nothing changed in the midsection, which is why we went on this diet. My husband doesn’t need to lose anywhere else because he is fit and lean except for ab area. I have developed a red bumpy rash under my eyes that we think may be from flax seed. No fat is flushing here and we don’t know why. very discouraging. Regarding the recipe above for cranberry juice, you cannot add sugar if you are using it for the fat flush plan, there is absolutely no sugar allowed. The only sweetener allowed is stevia. I went on the diet for two weeks and lost 1 stone! 10 pounds in the first week and then another 4 in the 2nd! I was simply amazed by the results! I went from a size 14 to a size 10 and went from weighing 10stone 4 to 9 stone 4! I strongly reccomend the fat flush diet to anyone! I’m on the 10th day of the lemon juice only plan and have went from a tight 36 inch Levi to a loose 34 inch one. My hardest part is SMELLING FOOD; one whiff and I go off to a magical All-You-Can-Eat Buffet Reastaurant in my mind. As a serial dieter, I realized this past spring that I had reached my highest weight ever. (I am 45, mother of three, high school teacher.) I bought the book and tried this diet. I found it the easiest plan to stick to. Always in the past, I had found it difficult to give up carbs and alcohol. On this diet, I didn’t even crave them. I lost 10 lbs the first week and 5 in the second. I am hoping that I am able to continue until I reach my goal of losing 40 lbs, and sustaining that loss. My daughters are 18 and 19. Should they ever need to lose some weight, I would recommend this plan. Maybe it’s just the calorie restrictions that’s working in this diet, and not actually any kind of magical body detoxification. Also, what good is losing weight if you can’t (or won’t) maintain the protocols of the diet to keep the weight off? Why not just count calories, drink lots of water, and eat healthy instead of spending all your money and time on fad diets? I was on this diet about 2 years ago and was sucessful. Just went back on it and this time it seems harder due to the headache I am constantly having this 1st week. I think after this week things should get better. I hope to achieve the same goal as I did 2 years ago. Also afterwards and during the maintenance I continued to drink 4 oz of the cranberry cocktail during the day along with my snacks/water and was able to achieve great results. I did this diet years ago and felt great and lost weight slowly but steadily. It is a commitment but once you get in the groove it is very easy to live with. Medical tests at that time showed excellent results. now, at 51 and diagnosed with hashimotos and having gained 4 pounds in one month, I am going to try it again – for the health and weight reduction benefits. No one could argue that the diet isn’t healthy – and if you need more food, well eat it, but know that may effect how quickly weight comes off. I love this program. I used it to “detox” my body before I got pregnant. Now that I am ready to lose the rest of my pregnancy weight (I gained 60 pounds and have about 25 left to lose) I decided to go back on the program to lose the weight. In 6 weeks I’ve lost 15 pounds and I feel great. It IS difficult to plan/prepare everything required- especially when you have kids to chase all day. But you can make your own modifications (for instance, I don’t use strictly organic stuff) and still be very successful with some simple planning ahead. It has helped me to “re-program” my mind and body to make better choices-even on those nights when I go out to eat. TRY IT! You’ll feel great! well im gonna try this diet im a diabetic and have been trying to lose weight!! This diet worked for me. I was only on it for around 2 months and lost about 20-25 lbs. The hardest part is sticking to it. I gained the weight back, but it took much longer to gain it back than it took to get it off. My goal was to lose 60 lbs. My goal now is to lose 70 lbs, and I hope to do that in 6 months. I am 69 years young and am a cancer patient. However my treatments have made me gain 150 pounds over the past six years. I have started this plan and have lost 13 pounds in the past 9 days. My doctors have told me that I couldn’t lose weight because of my medications.I guess they were wrong! I have not taken any pain medication or sleeping pills during this time, for the first time in the six years. I’m doing fine and will continue to see what happens next.